Performance Edge Chiropractic is proud to announce the addition of Adele Greene, LMT to our office. 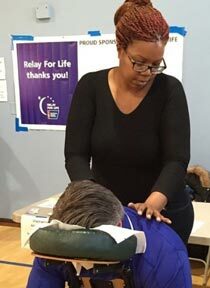 Adele Green LMT providing chair massage at a neighborhood Zumba event. I am a graduate of the Swedish Institute in New York City. I have an Associate’s Degree in Massage Therapy. During my career as a massage therapist, I have worked in hospitals, luxury hotels, conventions, spas, and in private practice. I believe that massage therapy can be used to help bring the body back into balance. It has also been proven to reduce stress, relieve tension, and improve circulation. I use effective tools in my practice, such as lava stones and aromatherapy. A regular massage added to your health maintenance plan is necessary for your well being.